Crafted from elastic and acrylic yarns, this all-weather accessory won’t lose its shape. 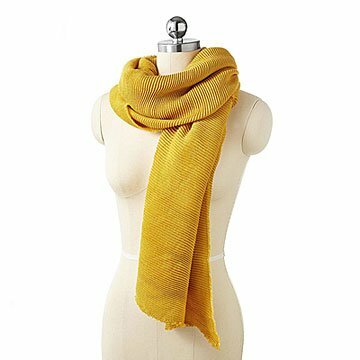 Add some excitement to your look year-round with this all-weather scarf covered in tiny, textural pleats. Crafted from elastic and acrylic yarns using a special weaving process, this nifty, lightweight accessory won"t lose its shape. All the better—it sure is fun to touch. Bonus for the spill-prone: It's hand washable! Made in China. Hand wash cold, lay flat to dry, cool iron if needed, only non-chlorine bleach if needed.